Legumes are plants or seeds belonging to the Fabaceae family. The fruit itself is a pod filled with dry seeds, including a variety of dry beans, which can be eaten by people and animals. Grain legumes such as lentils and peas are called pulses. These varieties are mainly grown for human consumption and feed for livestock. The nutritional value of one half-cup serving of cooked, unsalted legumes varies, but most deliver a high percentage of protein per calorie. The number of calories in beans and legumes will depend on preparation and serving size. Even if you’re getting a higher percentage of your daily intake from beans, because they are nutritionally-dense and filling, you’ll be less likely to deviate from your dietary goal with snacking and cravings. As an energy source, beans and legumes will help fuel your day-to-day activities and exercise routine. Your body uses carbohydrates for energy, but some forms work better than others. The quality of the carbohydrates in the foods you choose influences how your body uses them. One example is a measure called Glycemic Index (GI), which demonstrates how a particular type of carbohydrate affects your blood sugar levels. Beans and legumes may appear to be a “high-carb” food choice, but because they are a low-GI source, that means your body is using those carbs in a more efficient way to provide energy. Beans and legumes are filled with resistant starches (which do not get readily absorbed in the intestines), so they won’t cause spikes or drops in blood sugar levels. Low GI foods have also been shown to help reduce cholesterol levels and inflammation. Legumes are also full of soluble and insoluble fiber, both of which help you feel fuller longer and promote digestive regularity. Again, while preparation and portion influence the fat content of beans and legumes, most varieties are low-fat. One notable exception is peanuts, which contain much higher levels of mono- and polyunsaturated fats. When eaten in moderation, peanuts and peanut butter can be part of a well-balanced diet, but you don’t want to miss out on the health benefits of other legumes—most of which don’t contain saturated fat, meaning they won’t have an impact on your cholesterol. For those focused on building muscle, beans are a staple of protein-rich diets. For those eating a plant-based diet, the quality protein found in beans and legumes is essential. High-protein snacks and meals keep you feeling satisfied because your digestive system takes longer to digest these foods compared to simple carbohydrates. The energy your body gets from protein-dense foods is released in a sustained way throughout the day, meaning you won’t get the “crash” that often comes with sugary snacks that are sources of quick, but not long-lasting, energy. Even though they’re small, legumes are packed with essential nutrients including B vitamins, folate, zinc, calcium, and iron. Micronutrients are vital to the proper functioning of all your major organs and body systems, like your heart, immune system, and brain. Deficiencies in even a single type of micronutrient can lead to specific health problems. For example, having low iron can cause anemia and having too little vitamin A can affect your vision. Like other plant-based foods, legumes do not have any cholesterol and add little, if any, fat and sodium to your diet. Here’s a specific breakdown of the nutritional info for some of the most popular legumes and beans. 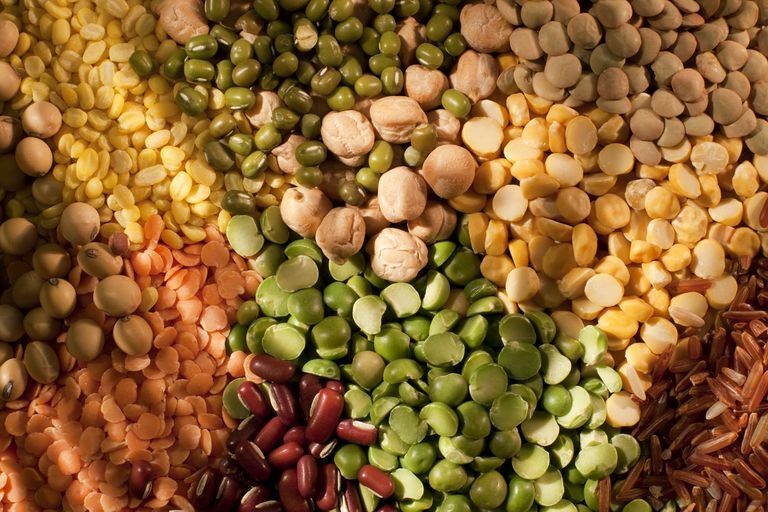 In addition to being nutritional powerhouses, when legumes are a regular part of your diet, research has shown they help lower blood pressure and reduce low-density lipoprotein (LDL) cholesterol. Legumes are also inexpensive, can often be bought in bulk, are versatile, and can be safely stored for long periods of time. Some people may not be able to safely consume certain types of legumes. Peanuts and soybeans are among the most common legume allergies and can also be very serious. Peanut allergies can cause a life-threatening reaction called anaphylaxis that requires immediate medical treatment. If you're allergic to one type of legume you may need to avoid other types due to cross-reactivity. Some people with peanut allergies are so sensitive that they don't even have to eat the nuts to get sick—just breathing in dust from a peanut shell can trigger a reaction. For this reason, many people with peanut allergies carry a special medicine called epinephrine (Epi-Pen) that they can administer (or someone else can) if they develop an anaphylactic reaction. If a person is told they are allergic to one type of legume, they may be advised to avoid other types due to a phenomenon called cross-reactivity. In this situation, a person with one type of legume allergy could have a similar reaction to another. One example is the cross-reactivity between peanuts and lupine. While most people in the United States probably think of lupine as a pretty plant, it's commonly used for eating in other parts of the world. When used in flour for baking, for instance, a person may not realize they are ingesting the allergen. If you have a food allergy, it's always important to check ingredient lists and ask about ingredients in foods others prepare for you, especially when traveling. Canning requires extremely high pressure that breaks down the starches in beans and makes them more accessible in the digestive system. By doing so, it can remove some of the key benefits of the resistant starch (which include maintaining the intestinal flora and normalizing bowel movements). One cup of cooked black-eyed peas has 11 grams fiber and 13 grams protein. For meat eaters, black-eyed peas go well with pork and bacon, but also work well in veggie-based soups and salads. Also known garbanzo beans, one cup of chickpeas has over 14 grams protein and 12 grams fiber. They can be eaten on their own or made into popular side dishes, like hummus. Their nutty flavor makes them a good source of protein for topping salads. They can also be dried, seasoned, and roasted for a poppable, kid-friendly snack. One cup of peas has 5 grams fiber and about 6 grams protein. Compared to other legumes, peas are lower in calories (a one cup serving of cooked peas has 83 calories). Bought fresh or grown in your garden, peas are nutrient-packed and tasty. Bagged, frozen peas are also a cheap and convenient addition to any meal. Cannellini beans, also known as white kidney beans, are large white beans with a smooth texture. Unlike other legumes, white kidney beans hold their shape well when you cook them. If you're looking for a bean to add to a dish whole, white kidney beans are a great option. One cup of cannellini beans has about 15 grams protein and 11 grams fiber. Great Northern beans are similar to other white beans but generally smaller and grainy in texture. Despite the differences, they'll work well as a substitute for any dish that calls for white beans. One cup of Great Northern beans has 8 grams protein and 7 grams fiber. When you think of classic baked beans, you're probably thinking of Navy beans. The small white beans have a mild flavor and softer texture. When cooked, they tend to easily break apart, so they're best used for purees, stews, and soups. One cup of Navy beans has 15 grams protein and 19 grams fiber. One cup of pinto beans has about 15 grams protein and 15 grams fiber. Pinto beans work well whether mashed up or whole, so they work in many different types of recipes. The beans are central to many popular Mexican dishes. Also known as Roman beans or borlotti beans, one cup of cranberry beans has 17 grams protein and 15 grams fiber. These medium-sized, soft, pink and tan beans are one of the easiest to prepare, cooking up in less than one hour. One of the largest beans you can buy, one cup of kidney beans has 17 grams protein and over 16 grams of fiber. With their firm texture, kidney beans are usually the first choice for chili and stews. One cup of lima beans has 15 grams protein and 13 grams fiber. These light-green beans, also known as butter beans, have a smooth texture and a nice flavor. Lima beans are a popular choice as a side dish but also make a tasty addition to soups, salads, and casseroles. While many legumes require prep work, lentils require no soaking, cook up quick, and can be added to many meals. With several varieties to choose from, including gold, red, and dark, if you've got 20 minutes to spare you can cook up a protein-rich, delicious meal. One cup of fava beans has 13 grams of protein and 9 grams of fiber. Fava beans require a little more effort than other legumes, mostly because they come in thick pods that you'll need to shuck before cooking. If you have the time to prepare them, fava beans are worth the extra work: they work well whether a recipe calls for firm or tender beans, can be seasoned and tossed on the grilled, and even snacked on as-is, popped fresh from the pod. Cooking dry beans at home is easy and is the best way to retain legumes' health benefits. It does require a little planning, however. With the exception of lentils and split peas, dry beans need to be soaked for at least a couple of hours prior to cooking. If you don't pre-soak your beans, make sure to add an extra hour or two to the cooking time. By soaking the beans first, you'll soften them up—making them easier to cook and digest. The pre-soak also helps remove excess starch which can ferment in the intestines and cause bloating and gas. If you're using larger beans, try letting them sit for an overnight soak. Adding a little salt to your soak can also help shorten the beans' cooking time. The traditional way: Fill a pot or bowl filled with water about two inches above the level of the beans. If salting, use one tablespoon of table salt or two tablespoons of coarse salt per pound of beans. Let soak for 4 to 12 hours. Drain and rinse before cooking. The faster way: Place beans in a pot and cover with two inches of water. Add salt and bring to a boil. Once boiling, turn off heat. Let sit for an hour. Drain and rinse before cooking. If you don't pre-soak the beans, add another hour or two to the cooking time. Once soaked, beans can be cooked according to the recipe you choose. When you're measuring, keep in mind that one cup of dried beans will yield around three cups of cooked beans. You can use a slow-cooker or cook them on the stovetop. While cooking, be sure to cover the beans with two inches of liquid and to replace the liquid as it evaporates. Always cook on a low temperature and avoid stirring too much, which can break down the beans and release excess starch. Smaller beans such as lentils or split peas take about 30 minutes to an hour to cook. Others types can take anywhere from 3 to 6 hours depending on their size. You'll know the beans are done when they are tender but not mushy. Leftover cooking liquid can be stored in the freezer for up to six months. Simply defrost and use as a base of a vegetarian soup or stew. Beans are remarkably versatile for cooking, salads, stir-fries, and even baking! Here are a few classic recipes, as well as a few new spins on old favorites, you can try. Beans and legumes are versatile, nutritious, tasty, and suitable for many different dietary goals and needs. However, some diets (particularly those followed by people with some bowel disorders) recommend avoiding them. Smaller servings of beans and legumes, such as chickpeas and lentils, are encouraged on many low-carb diets. All types of legumes and beans can be included in a low-carb diet, but how they are prepared and served can greatly influence their nutritional value. For example, when made with sugar or lard (such as baked beans, which are often packed with brown sugar and molasses) the powerful nutritional benefits of legumes are reduced. Similarly, soups such as split pea are traditionally prepared with fatback—a tasty but less healthy fat that is best enjoyed in moderation. Another important exception is peanuts. While peanuts are, by nature, a legume you’ll have to count them as a nut if you’re following a low-carb diet. For example, the South Beach Diet allows for one serving (two tablespoons) of natural peanut butter (with no added oil or sugar). Beans and legumes are suitable for a gluten-free diet. However, people who avoid gluten to manage certain digestive ailments may experience discomfort due to the high fiber content of some beans and legumes. Given their high fiber content, people adhering to a low FODMAP diet are advised to limit, or even completely, avoid beans and legumes. ﻿Beans get a reputation for being a gas-producing food due to their rich fiber content. If you find you have some digestive discomfort, try cooking beans in different ways or pairing them with foods that can subdue some of the gas-inducing qualities. Try classic combinations like rice and beans, as opposed to pairing your legumes only with other high fiber foods like cruciferous vegetables. Do beans really have more protein than meat? Some do! Vegetarians and meat-eaters alike are impressed to discover a serving of black beans (a half-cup) at dinner packs in more protein than a 3-ounce flank steak. How much do beans cost? Beans of all kinds are often a college-kid staple because you can cook them up according to many different tastes, they're easy to store, and generally quite cheap to buy—especially in bulk. Data from the U.S. Department of Agriculture shows the price of dry pulses, like lentils, has been consistently affordable for consumers. Whether you're just planning meals for yourself or your whole family, beans are a low-cost, high-nutrition addition to your pantry. Polak, R.; Phillips, E.; and Campbell, A. Legumes: Health Benefits and Culinary Approaches to Increase Intake. Clin Diabetes. 2015;33(4):198-205. DOI: 10.2337/diaclin.33.4.198. United States Department of Agriculture (USDA). National Nutrient Database for Standard Reference, Release 28. Washington, D.C.; updated 2016. Legumes and Nutrition. Grains & Legumes Nutrition Council. Secondary Analysis of the National Nutrition and Physical Activity Survey 2011-2012 https://www.glnc.org.au/legumes/legumes-nutrition/. Published 2015.